Nearly a week back in London and only grey overcast skies. So today is a view of where I was this time last week. 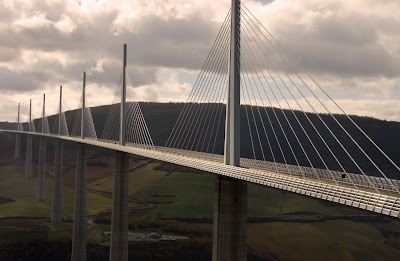 The Millau viaduct spans the Tarn Gorge in the South of France. An incredibly beautiful bridge (if one can say that about bridges). The tallest vehicular bridge in the world (actually taller than the Eiffel tower!) 2.5 kms across. Opened in December 2004. Winner of outstanding structure award. Standing on the hill to take this photo I wasn't sure if I'd be blown off the hill before I froze to death. I'd recommend waiting until summer for a visit. Take time to visit all the other skywatchers. Mo, you are right, it's an incredibly beautiful bridge! Great shot too! Fantastic image! Very impressive structure, too! It's beautiful Mo. I have to confess though, I get a little nervous crossing big bridges like this! PS: I've tagged you, come see! What a fabulous structure. You've got to hand it to the engineers, they outdid themselves. I don't like bridges,but that is a beautiful shot of a beautiful bridge.I really like the angle. The bridge is definitely a work of art. The photo looks great too with the valley and water being in the shade while the subject is nicely lit up and reaching for the sky. Impressive shot and lovely perspective! good for you that you braved the cold for us! I love this shot. I do think it is a rather pretty bridge, thanks. Mo: Neat capture of the bridge and sky. i think bridge shots are awesome with the drama of the height and the angles and the expanse. this is a great shot...thanks for sharing with us. Yes, bridges can be beautiful. Leave it to the French to turn a bridge into a work of art. We went camping over Thanksgiving so I'm late making the rounds. If you celebrate Thanksgiving I hope your holiday was a happy one. Hi Mo, I've been away so just now seeing your bridge photo. What a beautiful site and it's the world's tallest! I must put this on my list of places to visit. I'll take your advice and only go in the summer. We are proud of this bridge in France. A french skywatch. Fabulous. The clouds are so dramatic against the metal. What a bridge too. That bridge is a work of art. Amazing! Sorry you had to freeze for the photo, but worth while. Hang on to those negative ions. Also like the phone booth. They are just about a thing from the past in America. Fabulous photo for Sky Watch Friday, full of interesting lines and shapes and colour. Thanks for sharing with us all. You certainly CAN say that about bridges! And this is an amazing one. I'd love to drive across this. What a great vacation! I think it's the most beautiful bridge we have in France !